Mark Zona, awesome host of ZONA's Awesome Fishing Show and co-host of the Bassmaster Elite Series, wants all you GreatLakesBass.com 'ers and everyone else to make a big showing this week at the Plano Championship Chase on Lake St. Clair! Lots at stake! All for the first time in Michigan!! How can we not be excited! Attend the Plano Championship Chase at the Lake St. Clair Metropark! After starting the 2013 season with giant crowds at tiny Orange, Texas, and following last week's huge crowds in Waddington, New York, we have our work cut out for us! But we can handle it! We're Michigan! And this is our first Bassmaster Elite Series event ever! Plus, the Angler of the Year will be crowned in Michigan. We'll have four Michigan anglers fishing the big bass tournament! We can even help build more excitement for our first ever Toyota All-Star Week in Michigan next month - September 27 - 29 on Muskegon Lake!! Remember to visit Bassmaster.com/Vote every day! 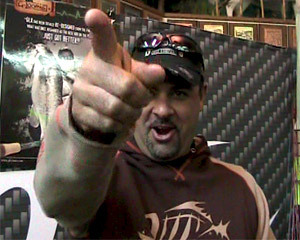 Mark Zona of ZONAs Awesome Fishing Show wants you to attend the 2013 Bassmaster Plano Championship Chase on Lake St. Clair and Toyota All-Star Week in Muskegon Michigan. While you're there, give a shout out to the ZTrain too - he's truly Michigan's bass ambassador! Come on down and watch 100 of the best bass anglers in the world show why Lake St. Clair is the #1 Bass Lake in the United States! You can see Zona in person as he co-hosts the Bassmasters with Tommy Sanders. Don't forget Z is a Michigander too! Plus, there's our funny man neighbor Dave Mercer, Bassmaster Elite Series emcee and host of Facts of Fishing, along with all the other great stuff for the family and anglers. See below. NOTE: Activities & times are subject to change.